Mackie's C4 controller has been a long time coming, but now that it's here, it provides real-time control for a variety of supported sequencers and their plug-ins, including Apple's Logic, Cakewalk Sonar, and Mackie's own Tracktion. Mackie's C4 must have taken longer to build than almost any other product in the history of music hardware, as I first saw a prototype back in the days before Emagic was owned by Apple and when Logic Control was still new on the scene! It seems that the C4 got put on the back burner while Apple developed support for the C4 in version 7 of Logic, but now that it is available, it makes a very welcome addition to any Logic Control or Mackie Control Universal system. The C4 can also be used on its own, but in my view it works best as part of a system that includes a Mackie Control or Logic Control. How well the C4 works with your chosen software depends on how well your DAW manufacturer (and the various plug-in designers) supports it, because unlike cheaper assignable systems, all Mackie Control devices have a fixed set of protocols, and it is up to the DAW manufacturer to support them. Having said that, Logic now allows you to make custom assignments, so there's more flexibility available if you have the skill and patience. Currently Logic Pro 7, Logic Express 7, Sonar 4 and Tracktion 2 support C4, but the other major players are said to be trying to improve on that situation. Sonar 4 has built-in support for the Mackie Control Universal, but Sonar 3 can also be used with the C4 — Cakewalk have a support file on their web site that you drop into Sonar 's Controllers folder to enable this. Reason and Live versions are currently in beta testing, and should be available soon. Physically, the C4 is the same size as the Mackie Control Expander, and it has the same cosmetic styling. Because of this, the upper display is conveniently angled but the other three are set out flat against the front panel and so are a little less easy to see unless you're leaning over the unit slightly. The C4 comes with an external power supply that auto-switches to the local voltage, and it communicated via five-pin MIDI jacks, requiring a whole free MIDI In and Out port to function. I'm sure that if Mackie were designing their controller range from scratch today, we'd have USB connectivity instead of or as well as five-pin MIDI, but as it is, a multi-port MIDI interface is essential for anyone setting up a multi-surface Mackie Control system. Unlike Mackie Control Universal and its expanders, which have only eight V-pots each, the C4 provides four rows of eight V-pots, each with its own 2 x 54-character LED info strip, which is why it costs rather more than the other expanders. Each V-pot incorporates a ring of positional LEDs and a push switch in the same way that the rest of the Mackie Control series does. This layout means the C4 can simultaneously control and view up to 32 plug-in or DAW parameters without switching banks or flipping through pages, though you can easily do so where there are more than 32 parameters to control. As with the Mackie Control Universal, the V-pots are actually rotary encoders, and the function being controlled by any particular V-pot is shown in the strip display directly above that V-pot. Depending on how you set the preferences when using the C4 with Logic Control, the top row of the display can show either the parameter name or its value. Many of the controls are self-explanatory, but others require an introduction (note here that I reviewed the C4 using Logic Pro 7, and I appreciate that the 'driving experience' may be different with other platforms!). At the bottom of the front panel are various buttons grouped into different areas, labelled Function, Assignment, Modifiers, and Parameter, plus a cluster of cursor buttons. Using the cursor in conjunction with the Parameter controls allows you to move up and down through the channel insert slots to access your plug-ins. If Channel Strip mode is selected in the Assignments section, the C4 provides a detailed overview of the current channel's parameters, including EQ, any inserted plug-ins, sends, pan, output select, track mode, and surround functions where active. The EQ settings for the channel where the EQ is inserted show up on the top row with the first eight inserts shown on the next. Up to eight sends are visible at one time on the third row, while the fourth shows the channel routing and automation status along with volume and pan. If you push the encoder relating to an active insert plug-in or software instrument, its parameters come up for editing. Using the Split function, you can also get parameters for two lots of plug-ins in the upper and lower halves of the units. If you have more than one C4, Split also works across multiple C4 units. It's all quiet round the back of the C4, with just five-pin MIDI In and Out sockets. Note that there's no USB MIDI, so you'll need multi-port MIDI interfacing to unite the MIDI from the C4 with that from other Mackie Control or Logic Control units.You can move along the tracks using the cursor buttons, so you aren't limited to what is selected on your other Logic Controls or in Logic 's Arrange page, though the C4's display always jumps when you select a new track in Logic, which is what you'd expect. After that, you can navigate where you like, though I did find it easy to get lost if I moved away from the selected channel. If you have another Logic Control or Mackie Control Universal unit, then it is probably best to select your channels that way. In the Assignment section, the Marker button flips between Marker and normal view while Track flips between Track and normal view. Channel Strip switches between Channel Strip view and normal view and in normal view (when no Assignment LEDs are lit), the control surface provides a view of the selected channel's send status. The Function button switches between Function view and normal view, where the Functions provided include Channel Strip delay, Event Float, automation functions, the tools from the toolbar, various zoom and quantise options, and so on. Some may feel there are already perfectly adequate keyboard shortcuts for these purposes, but being able to call up the Event Float at the push of a button is nice, and it also means you don't have to remember which key combinations call up the function you need. However, not all the buttons worked as I expected. For example, pressing the Track button puts you into something akin to Global mode, where you see all the available audio, MIDI and instrument tracks from your Environment page (you can select which ones to view), whereas it would seem to make sense if you only saw the ones used in your song. I was also sure there ought to be a way to bring up, for example, 32 of the same numbered Sends at a time, but I couldn't find a way to do this either. 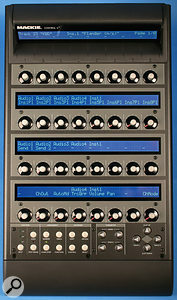 In the Modifier section, the buttons work as they do in Logic Control or Mackie Control Universal configured for use with Logic, in so far as they duplicate the Shift, Option, Control and Command/Alt functions found on the computer keyboard, as well as their dedicated Logic Control functions. The C4 Commander software. The left half shows the C4's control surface, while the right allows you to manage exactly how you map the C4's controls to your hardware and software instruments, and save these mappings as so-called Instrument layouts. 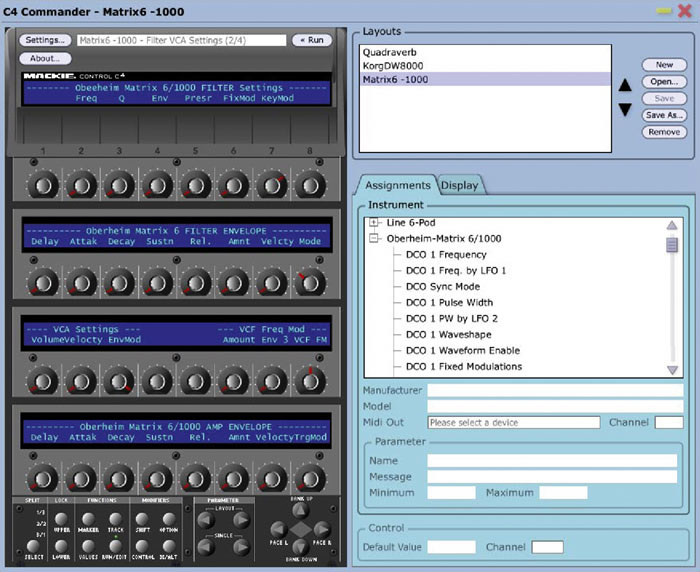 During the course of this review, Mackie released a piece of PC- and Mac-compatible software called C4 Commander, or C4C, which is an on-screen representation of the C4. 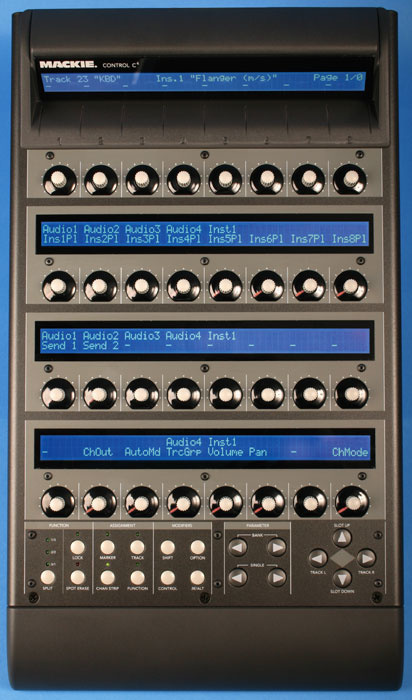 The idea is that you can create custom control surfaces for different hardware and software instruments and a large number of Instrument 'personalities' are included. At the time of the review, when you load one of these, you don't get a pre-defined template but rather are given the opportunity to drag individual control functions from a list pertaining to your selected instrument onto the C4 knobs of your choice. This is both fast and useful, as you can choose which are the most important parameters for any given MIDI device and then arrange them in the order you like best. Parameter names are reflected in the scribble strips (both real and virtual), and once you've created a setup, which only takes minutes, you can then save it for future use. Complete templates for a variety of instruments are expected to be included with the release versions. The early release of C4C I got to play with first exposed a few bugs, but just before this review went to press, Mackie sent me a new version of the C4C software that appeared to work correctly on my Mac OS 10.4.3 system. Essentially, any changes made on the real C4 are reflected in the on-screen representation and vice versa. This is a very nice addition to the C4 and greatly extends its usefulness beyond simply controlling software plug-ins and sequencer parameters. 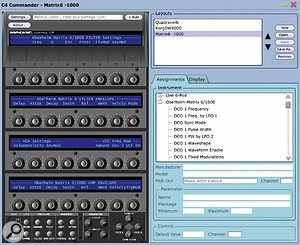 Used within Logic 7.1.1, the C4 was recognised by my system once it had been hooked into my MIDI interface and switched on, but to use it independently of the main Logic Control system (I use a Logic Control and two expanders), its icon needs to be dragged below the other units in the Control Surface Setup window to create a new control group. You can then go into the Parameter box and decide whether the default display should be by name or parameter. Everything clearly worked and the basic ethos seemed very similar to Logic Control, but not everything is intuitive, so you have to spend a little time trying to figure things out. The basic functions are pretty obvious, and fall easily enough to hand, but others remain elusive and I'm not entirely sure the review unit didn't have a damaged V-pot as it felt a little stiff, and opening plug-ins using its push function seemed a bit hit and miss. From my own perspective, there are features of the original Logic and Mackie Universal Controls that are so counter-intuitive that they have me reaching for my mouse, and some of this has clearly brushed off on the C4. Of course, some people love working with these interfaces, but for me, some things are better via the interface and some via the mouse. I'd expected to see the sends come up as a display choice in Track mode, but if that's possible, I didn't find the magic combination. Apparently Mackie are in touch with the Logic developers at Apple, and will pass on user feedback as to what can be improved in this area. Not surprisingly, Mackie feel that the C4 implementation is optimal when teamed with their Tracktion software, as they have control over both components of the system. Used with an existing Logic Control system, I have no doubt that the C4 can speed up the access to common parameters, and it is excellent for tweaking plug-ins. In this respect, some plug-ins are more cooperative than others when it comes to being controlled by hardware such as the C4, so while the majority will show you the parameters' names and, hopefully, show you the most important parameters first, it is by no means certain that all will do so. In fact I had one third-party plug-in running that wouldn't even respond to the C4, but I think this is more of an issue to do with Logic and its integration with that plug-in than a fault of the C4 itself. Criticisms aside, the ability to access multiple plug-in parameters at one time is the one thing that would most make me consider adding a C4 to my system. From Channel Strip mode, this is the most intuitive part of the whole concept and is a joy to use. Where there are more than 32 parameters, the Bank mode flips you through the various pages in a painless manner or you can move along one parameter at a time using the Single buttons. I guess what this boils down to is that I'm very pleased with the Channel Strip mode and have no worries about the Functions mode, but Track mode currently seems to offer little that I can't access from my existing Logic Control unit, and little that I can't do more intuitively using my mouse. Is the C4 an expensive luxury, then, or an essential purchase? I suppose your answer to this depends on the way that you work. If you need a lot of real-time control over multiple plug-in parameters, the C4 makes life much easier. It also offers comprehensive channel-strip control, which I really liked. On the other hand, if you tend to call up plug-ins, set the parameters, and then leave them alone, I reckon the chances are that you could probably manage without a C4. 32 sets of channel controls in a very compact unit. Seamless integration with other Logic Control and Mackie Control units. The most important functions are easy to navigate. Relatively expensive due to the number of displays and V-Pots. Some control functions are obscure when working with Logic. As with the other Mackie Control units in the range, the C4 is a very nicely made piece of hardware, and is supported by many of the leading sequencer manufacturers. It offers a lot of control and visual feedback in a small space and is particularly good for accessing and adjusting plug-ins. Some features are less intuitive than I feel they could be, but in the main, the C4 does what it sets out to do very effectively. The accompanying C4C software is a nice addition and makes controlling plug-ins and external MIDI hardware much easier.